Does Larry Summers Support Countercyclical Regulatory Policy? EK: What about ideas to simply speed up the regulatory process during downturns? LS: This could be very important. Harvard built a whole football stadium in the 1890s with less than two years from the idea’s conception to the stadium opening. That kind of thing does not happen today. My attitude is we probably slow things down unnecessarily with our various approval processes. So I’m sympathetic speeding the regulatory process during recessions. But I have to be honest and say my enthusiasm for reducing regulatory processes in recessions is in significant part a reflection of a more general concern about regulatory delays. As the key gatekeeper for pharmaceutical and device innovation, the Food and Drug Administration (FDA) has a tough job. If it is too lenient, it will allow the sale of drugs and medical technology that could harm vulnerable Americans. Too tight, and the U.S. is being deprived of key innovations that could cut costs, increase health, and create jobs. With this in mind, this paper addresses the question: Is the FDA unintentionally choking off cost-saving medical innovation? First, I discuss the difficulty of assessing whether the FDA is under-regulating or overregulating new drugs and devices, given the desire for safety. I then show how the FDA is clearly applying “too-high” standards in the case of one noninvasive device currently under consideration—MelaFind, a handheld computer vision system intended to help dermatologists decide which suspicious skin lesions should be biopsied for potential melanoma, a life-threatening skin cancer. I then draw analogies to development of the early cell phones and personal computers. If the FDA fails to approve MelaFind, it would be the equivalent of rejecting the first cell phone on the grounds that callers might mishear important messages. I just heard Cass Sunstein speak on Obama’s attempt to trim unnecessary rules and reduce the burden on the private sector. 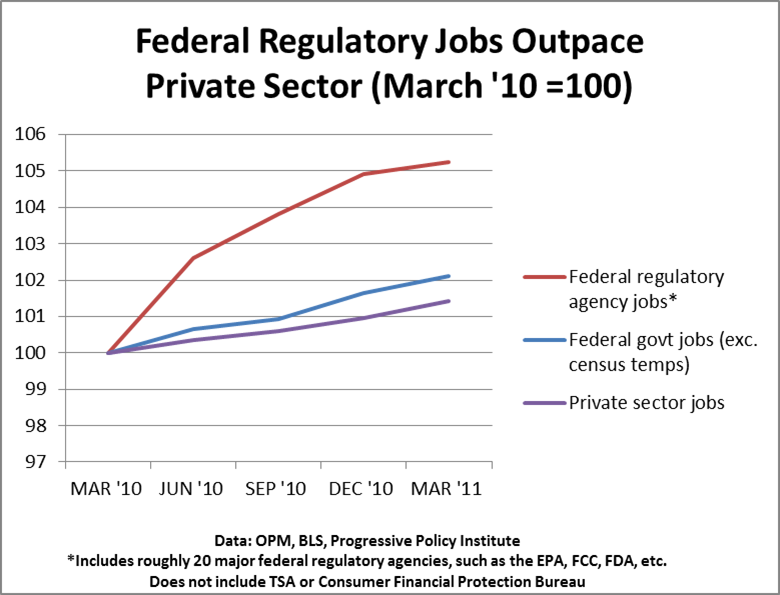 Yet here’s a fact: over the past year, employment at federal regulatory agencies has grown by more than 5%. By comparison, private sector jobs only rose by about 1.5% over the same period. That suggests regulatory intensity is still rising, even as the recovery lags. A few details of the calculation are below the fold. Imagine that you had an industry where customer satisfaction was increasing faster than any other part of the economy. Now imagine that the same industry showed rising real investment, even during the worst recession in 75 years. Finally, imagine that industry charged falling prices for both consumers and businesses. But of course, that industry is not imaginary: The telecom industry, and in particular the wireless sector, has outperformed the rest of the economy on key measures such as customer satisfaction, investment, and price. Moreover, at a time when President Obama is calling for more innovation, the wireless industry has produced more genuine new products and services than anyone else. So given the great performance of the industry during this tough period, why the heck does the Federal Communications Commission keep imposing additional regulations on wireless providers? The latest case of regulatory overreach: On April 7, the FCC issued an order forcing the big wireless providers to sign ‘data-roaming’ agreements with smaller carriers. In effect, the smaller carriers can now tell their customers that they could have data service all over the U.S., free-riding on the mammoth investments by the big carriers. In addition, the FCC made it clear that it is willing to set the price for each data roaming agreement if it doesn’t like what the big carriers are offering–effectively reinstituting price regulation for the most dynamic sector of the economy. This aggressive regulatory move by the FCC follow its enactment of confusing ‘net neutrality regulations’ in December 2010, an 87-page order that raises more questions than it resolves. And then coming down the road is the ‘bill shock’ regulation. In order to address the rather rare and fixable problem of a surprisingly high bill, this regulation would force providers to spend scarce investment dollars on revamping their billing system rather than building out their networks. In many ways, enacting this series of regulations is like throwing pebbles in a stream. One pebble doesn’t make much of a difference, but throwing enough pebbles in the stream can dam it up. Frankly, the degree of regulation that the FCC wants to impose is more appropriate to a failing industry rather than one which is demonstrably successful and growing. Let’s just run through the performance of the telecom/wireless industry over the past five years. 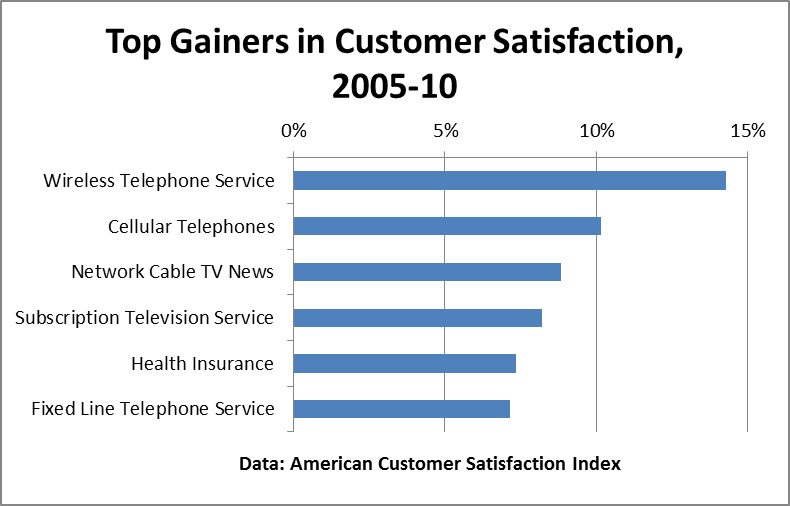 According to the American Customer Satisfaction Index, satisfaction with wireless service has increased by 14% over the past five years, by far the biggest jump of any industry. Now let’s look at investment. The data on investment is somewhat fuzzier than for satisfaction, since the government’s figures on industry investment only run through 2009, and merges the telecom and broadcasting industries. 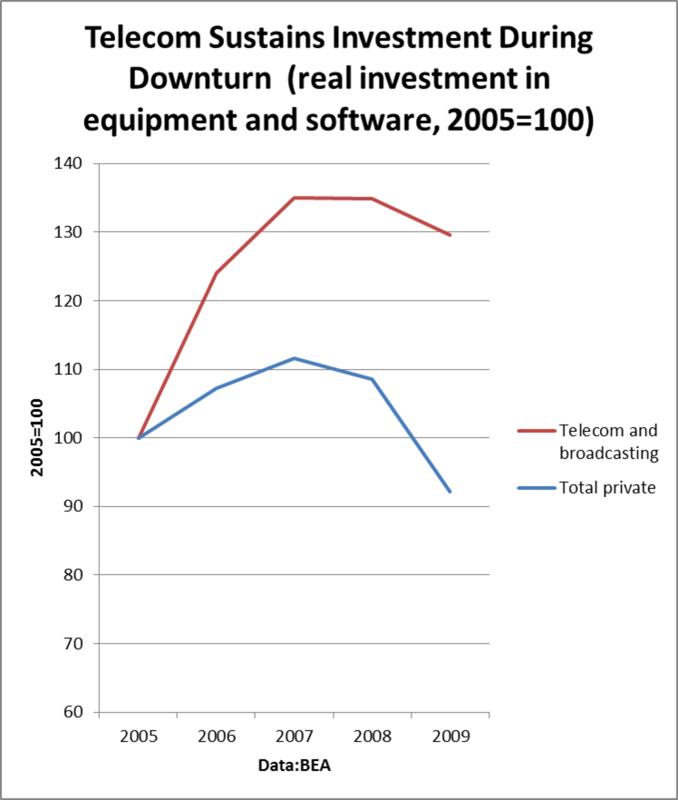 But here’s what we see: In the telecom/broadcasting industry, real investment in equipment and software is up 30% since 2005, despite the turbulence of the financial crisis. By contrast, overall private sector real investment in equipment and software is down 8% over the same period. And then of course the price of wireless service keeps falling. The latest figures from the Bureau of Labor Statistics say that consumer wireless prices are down 6% since 2011, and business wireless prices are down a lot more. Right now the FCC has the good fortune to preside over one of the few growing industries in the economy. If the commissioners genuinely want to support innovation and growth, they should stop throwing regulatory pebbles into the stream. I’ve been thinking a bit more about the analogy of regulation as throwing small pebbles into a stream, and if you throw too many pebbles in, the stream can be dammed up. Maybe this is related to the idea of congestion pricing in transportation. Each additional vehicle imposes a negative externality on other vehicles using the same road, so many transportation economists have supported the idea of using variable tolls or congestion pricing to give drivers the correct incentives. In the same way, maybe we can give regulators better incentives by adjusting cost-benefit analyses for the negative externalities of regulation. The question then is the size of the negative externality factor. Traffic engineers tend to study congestion using turbulence models. These models can give a variety of different behaviors, include sharp shifts in phase where traffic suddenly shifts from free-flowing to congested to stopped. I do wonder whether there is an analogy for regulation…hmmm. In my paper on the Regulatory Improvement Commission, I argued that adding new regulations was like tossing small pebbles into a stream. Each pebble by itself would have very little effect on the flow of the stream. But throw in enough small pebbles and you can make a very effective dam. Why does this happen? The answer is that each pebble by itself is harmless. But each pebble, by diverting the water into an ever-smaller area, creates a ‘negative externality’ that creates more turbulence and slows the water flow. Similarly, apparently harmless regulations can create negative externalities that add up over time, by forcing companies to spending time and energy meeting the new requirements. That reduces business flexibility and hurts innovation and growth. For example, consider the ‘bill shock’ regulations now under consideration by the FCC. ‘Bill shock’ is when someone gets a mobile bill that is higher than they expected—say, a large roaming charge. This problem is annoying but not life-threatening. Now, here’s where we come to the tale of the pebble and the stream. The rule of thumb about IT projects is that they are always more complicated and take longer than you think. More precisely, it would be a major and costly effort to build a system that in real-time accurately tracks customer total charges on the home system and on domestic and international roaming systems. The key words here are ‘real-time’ and ‘accurate’ in the same sentence—the two together translate into expensive. The bottom line is that if the bill shock regulations are enacted, significant resources—IT personnel and dollars–would be diverted into building and maintaining this real-time/accurate charge tracking system. The number of beneficiaries—the people who are truly surprised by ‘bill shock’– would be relatively small. What’s more, these are resources that would not be available for innovation and improvements to the whole network. This negative externality—the potential slowdown in innovation and the pace of network improvements– is not measured as part of conventional cost-benefit analysis. Depending on how many other regulations are being enacted, it could be another pebble that helps dam up the stream. Indeed, this suggests we should not evaluate regulations one at a time, but rather as part of a larger context. Think of the impact of a regulation as the net benefit of that regulation plus a negative externality E. That negative externality sums over all regulations on that industry. The more regulations, the bigger the negative impact. From that perspective, in order to meet President Obama’s goal to eliminate regulations that hurt job creation, conventional cost-benefit analysis is not enough. Agencies such as the FCC need to look skeptically at the bill shock rule and other borderline regulations that could impose genuine negative externalities on job growth and innovation without helping many people. What is innovation in government? It’s not just about transparency or finding cheaper ways to deliver existing services. Instead, innovation in government is about changing the rules and dynamics to achieve our social goals without intervening in the private sector more than is absolutely necessary. In particular, I’ve grown increasingly concerned about the accretion of regulations as a barrier to businesses bringing beneficial new technologies to market. The problem is that we don’t have a good mechanism for identifying and modifying regulations that are obsolete and burdensome. So, here’s a new paper I wrote for PPI entitled Reviving Jobs and Innovation: A Progressive Approach to Improving Regulation. Today, the U.S. is suffering from a regulatory paradox: Too few and too many regulations at the same time. On the one hand, financial services were clearly under-regulated during the 2000s, making financial reform essential. Similarly, President Obama’s healthcare reform bill was a key first step to reining in medical costs. But in other areas we see an accumulation of rules and regulations over the past decade. The trend started with the vast expansion of homeland security regulation under the Bush administration and continued through the first two years of the Obama administration. That’s why President Obama should be applauded for issuing his executive order “Improving Regulation and Regulatory Review” on January 18. The order asked agencies to pay more attention to promoting innovation as part of the regulatory process. In addition, agencies were directed to come up with a plan for reviewing their existing significant regulations. However, the president’s executive order did not go far enough. A regulatory ‘self-review’ process has been tried repeatedly in the past, and it’s always fallen far short of expectations. Regulators have a tough time trimming their own regulations, given internal bureaucratic pressures. But don’t blame the agencies—neither Congress nor the executive branch has a good way of reviewing and reforming existing regulations, even when they have become outdated or burdensome. The regulatory system needs a mechanism to address this need for periodic review. We propose a Regulatory Improvement Commission (RIC), an independent body analogous to the BRAC Commissions for evaluating military base closures. This is designed to build on the president’s executive order, and in the process improve its effectiveness. The RIC will take a principled approach to evaluating and pruning existing regulations, gather input from all stakeholders (not just business or just agencies), and do so in a manner that ensures we protect public health, safety, and the environment.